Granite is a strong, tough mineral often used in building blocks and tiles. 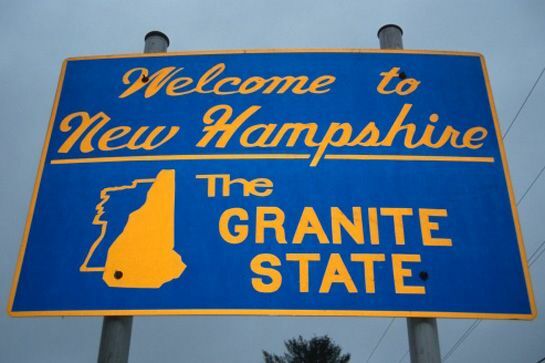 It is also the state rock of New Hampshire, the state that has stayed strong for over a hundred years, holding the first primary in the nation since 1916. But many people, political scientists and average joes alike, have questioned the granite state’s powerful role in selecting the nation’s presidential nominees. When contemplating how to tackle the issues inherent in our primary system, I keep going back to the main benefit and the main drawback of New Hampshire being first on the primary calendar. For the most part, it comes down to retail politics versus a lack of national representation. Before looking at the wider picture, I want to look at those two features in-depth. New Hampshire is small enough (in both physical size and population) to make retail politics a very real thing that almost any citizen can take part in. You can transverse the state, from top to bottom, in about four hours. For comparison, I have to drive two hours in either direction (Dallas to the north, Austin to the south) to get to the nearest commercial airport from my house in Waco. That ease of travel dramatically lowers the cost, in money and manpower, of going to venues large and small to talk directly with the electorate. However, while I have most certainly seen the benefits of being able to see all the candidates up close and personal, it is easy to get caught up in the sentiment of it all. Therefore, two questions must be asked when really weighing the true benefits of retail politics in New Hampshire: how effective are more intimate venues and town halls in actually giving the residents of New Hampshire a good way of vetting the candidates and does the process outweigh the fact that the vast majority (94%, according to the US Census Bureau) of the “vetters” are white, which is not at all representative of the nation as a whole. On the first question: it’s very easy, especially when you’ve gone to town halls and rallies with less than a thousand people, to be enchanted by the magic of politicians in 3D. Most people only ever see those who govern over us on TV and in pictures, where commentary and media noise often overshadows the person themselves, creating its own kind of augmented reality. For me, I had several mini-epiphanies of, “Oh wow, this is a real person. With flesh, and thoughts, and a personality.” I think it also makes politics more tangible; although canned phrases and answers were still abound at these events, each candidate takes a calculated risk when they let regular people hurl at them any question their heart desires. I saw a couple askers rant and lecture candidates, but I also saw quite a few who fished for the answer they wanted. Through all the awe, I still have to weigh the objective benefit. I think, obviously, it depends on the person, but seeing a candidate with your own eyes may help someone make a decision. It certainly made me like some people I may have been neutral about before, even if I don’t agree with them on many policies. So, for those who lean heavily on New Hampshire to push them through to Super Tuesday, it can be worth it. But the second question is more relevant to the wider question of New Hampshire. Even if retail politics is beneficial to the voters of New Hampshire and those campaigning here, what about the nation? Can that outweigh the fact that the Granite State’s population looks nothing like the US’s? I’m not so sure. If you look at New Hampshire as having the first primary as a function of it being uniquely qualified, and not simply out of a happenstance leveraged into a tradition, then the state must qualify beyond what good it does to its own citizens and the politicians running here. The primary, and the politicking that occurs because of it, must be beneficial to national politics and elections. However, when you look at the unrepresentative population, any benefit gained is negated by the fact that many of the issues that matter to a large portion of America are not even mentioned in this small, white, upper-New England state. What good is it to a Texan like me if no one discusses the nuances of the border issues and immigration, instead making generalizations for a crowd who likely deals with as many Canadians as Mexicans? Or what good is it to those who have concerns about agriculture, green tech, race issues, religious issues, urban issues, and everything else that Americans everywhere care about? Then if New Hampshire is not, in fact, the most qualified state to hold the first primary in the nation, is there a better alternative? There have been several proposed reforms throughout the years, made by people who see the negatives of the current calendar and wish to change it. The one I believe would best bestow benefits on the nation is, unsurprisingly, one that would group every primary together into one large, national primary. This would, unfortunately, make the retail politics New Hampshire is known for less feasible. But as I already argued, the benefits of getting cozy with candidates don’t really spread much beyond the region politicked. A national primary was first proposed in 1911, before New Hampshire was even positioned in first place, but was never able to get very far, even though over 100 bills have since then been proposed. The national primary is simple, fair, and generally widely favored. The biggest roadblock in something like it getting through is Iowa and New Hampshire obstinately clinging to the institutions that benefit their politics, people, and economy. And of course they do; I would also be proud if my state held one of the most politically influential elections of each presidential cycle. There are, of course, arguments against a national primary. Some contend that a one-day national primary would make it prohibitively difficult for smaller candidates with less cash at hand to mount a successful campaign. But the current system is not much better, especially with super PACs dumping billions into the system. A national primary would also possibly mean a shortening of what many see as an obnoxiously long election cycle, meaning some sort of change in the way the invisible primary (when potential candidates court donors and presidential chances) influences turnout. There would, of course, be both intended and unintended consequences that would have to be dealt with and corrected for, but if we want to make the system better and fairer, then a change in the primary system cannot just consist of one thing – it must be multi-layered and sweeping to be effective. The final question is, then, if our current system would allow us to drop a 100-year tradition and moved to a national primary. Granite is strong, and steady, but not fireproof. It would take something like a fire to cause New Hampshire’s first place to crumble; the party elite have pandered to the state for too long to want things to change now, and they like the power over candidates it gives them. Congress has the power, but again might not want to upset the order of the current system. It would either take an extreme event showcasing the weaknesses of New Hampshire, or someone with the means getting fed up and taking action. For now, the granite foundation of the presidential nominating process holds strong. --Carly Fitzgerald is a sophomore at St. Olaf College majoring in political science and psychology. She is in New Hampshire as part of a St. Olaf political science class studying the presidential election.